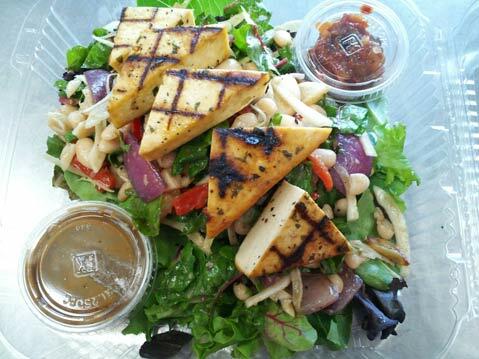 Daily Greenz's Tuscan tofu salad. If you had a resolution to eat well in 2012, there’s no better place to begin than Daily Greenz (dailygreenzetc.com,  636-3812), which will deliver fresh, usually all-organic lunches to your workplace. What? Daily Greenz’s menu is farmers-market driven, so it can change every other week. Cisneros likes to call the food “very filling without feeling heavy.” Some of the customers’ favorites are the grilled lemongrass chicken salad featuring rice noodles (it’s wheat-free, then) with a cool and refreshing chili-lime dressing, the grilled eggplant mezze wrap (Cisneros says customers have threatened them if they ever dare take it off the menu), and the flank steak wrap, usually made with Rancho San Julian Beef and dressed up with goat cheese, roasted garlic aioli, and cilantro pesto.